Bromleys has chosen The Anthony Seddon Fund, which supports people with mental health problems, as its charity of the year for 2017. Anthony, who lived in Ashton-under-Lyne, took his own life in 2013 at the age of 30 after a 12-year battle with bipolar disorder. His family set up the charity in his memory to raise money to improve the quality of life of people with mental illness and their relatives, friends and carers. It also campaigns to increase awareness about the issue among the public, in particular young people. The charity has a shop on Market Street in Ashton and recently opened a well-being drop-in centre on Stamford Street in the town for events, advice sessions and information. Carol Parker, Bromleys’ marketing associate, said: “The Anthony Seddon Fund is an excellent local charity which provides invaluable assistance to people suffering from various forms of mental health issues. Anthony’s mum Donna Thomas said: “We’re thrilled that Bromleys has chosen us to be its charity of the year. Every penny raised will go directly to providing support in the community for local people who experience mental health issues. Meanwhile Bromleys’ senior partner Mark Hirst has handed over a cheque for £1,103.25 to the Royal Manchester Children’s Hospital, which was the firm’s charity of the year in 2016. Staff raised the money through events including a Mexican Food day, dress-down Fridays, an Olympics-themed networking event and a Christmas jumper day. 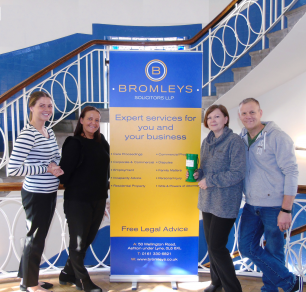 During the course of last year, Bromleys raised nearly £3,500 overall for good causes, including Willow Wood Hospice, Beechwood Cancer Care and Community Action Nepal.